When it comes to pest control in Vaughan, Newmarket, and the Greater Toronto Area, raccoons are a common occurrence. Like humans, they want safe, warm, and quiet places to call their home. In the wild, this can be in trees and burrows. In the city, however, they may also take up residence in attics, garages, crawlspaces, and chimneys. Raccoons can damage your home by tearing roof shingles, breaking attic vents, and chewing on structural beams. If they move into your chimney, they can obstruct airflow, causing smoke to re-enter your home. Most seriously, they often chew through the insulation on electrical wires, creating a potential fire hazard. Although these animals are rarely physically aggressive, it’s best to have them removed from your home. How can you prevent raccoons from entering your home in the first place? What do you do when you notice signs of them on your property? Here are some tips to help keep your home free of raccoons. Raccoons will eat just about anything; they aren’t picky. Without knowing it, your house could become an all-you-can-eat buffet for raccoons. Start by assessing your garbage bins and storage area. Raccoons are highly intelligent creatures. They’ve learned how to open trash bins and lids to get to the gold inside. Toronto has provided locking compost bins for residents to prevent raccoons from opening them and getting inside. Recent news has reported that some raccoons have learned how to unlock these bins. The area you store your garbage bins in could also be attracting raccoons. Is the area clean and free of fallen trash or food? Do you take your waste to the curb each week when it’s due, or do you leave it in the bin beside your house until the container is full? Dissuade raccoons from entering your property by keeping the waste bins clean, locked, and emptied regularly. Other food sources also attract raccoons to your house. Bird feeders make a satisfying snack for raccoons. They will even eat cat or dog food straight out of your pet’s bowl. Take the food dish back into the house as soon as your pet is finished eating; or feed them inside, if possible. Consider moving a bird feeder to the edge of your property, away from any buildings. Raccoons are excellent climbers and will find a way to eat your bird feed. When you provide a constant source of food, be it garbage or bird feed, raccoons will continue to be on your property. As the weather gets colder and they look for a winter home, your house will be an attractive option to a raccoon if it’s near their food source. There are a handful of common ways raccoons can enter your home. You can prevent them from moving in by ensuring these entry points are sealed and secure. Start with your home. Check the exterior walls, roofline, and soffits for signs of damage. Locate and seal any cracks or holes in your brick or vinyl siding. Raccoons can fit through holes as small as 2.5 by 4 inches. This will not only help prevent access by raccoons, but also by other pests that want to move in. 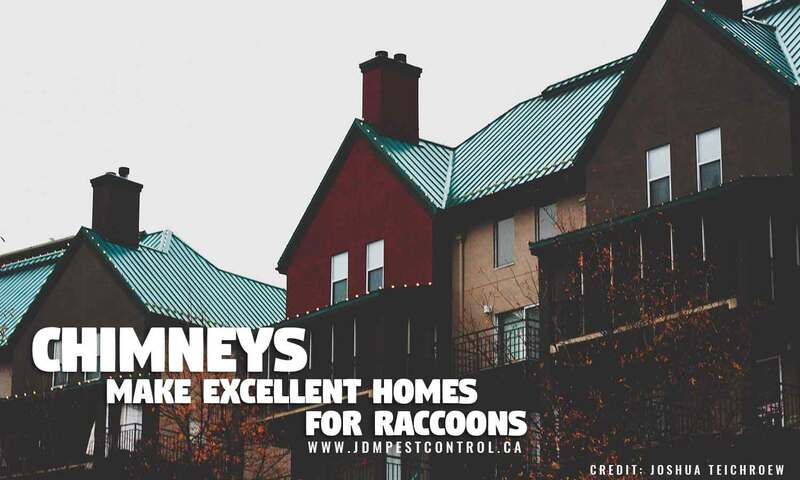 Check your roof, soffits, and ventilation ports for damage to prevent raccoon access. You can do this by getting a ladder and climbing up yourself, or by hiring a professional. Ensure that the roof shingles are all secure and unbroken. Sometimes raccoons will pull or break roof shingles off to get into the attic. Make this more difficult for them by securing each shingle and reinforcing them. Assess your ventilation ports and chimney. 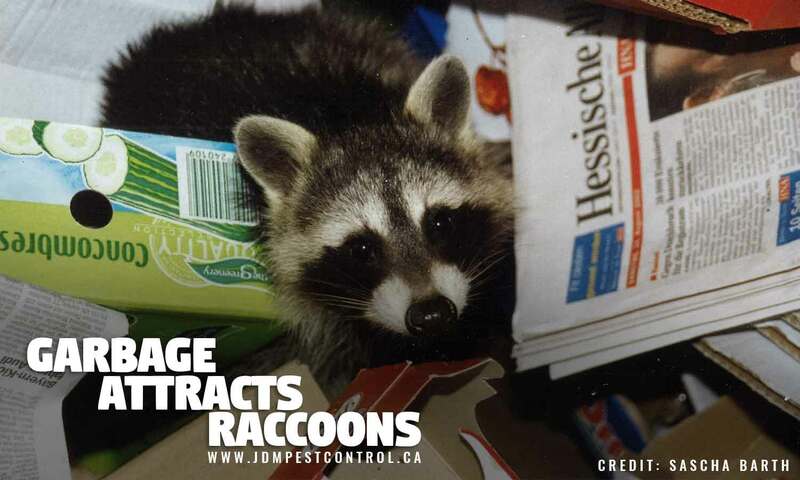 Look for loose pieces or broken structures where a raccoon or other pest might enter. Next, inspect your garage or shed. Look at the walls, ceiling, and floor and check for holes and cracks, inside and out. Loose or wet pieces of drywall are potential entryways as raccoons aren’t opposed to chewing or pushing their way in. Avoid keeping any food sources in your garage or shed. If it can’t be moved into your house, make sure that it is stored inside a sealed, locked container. If you do notice a potential entry point in your home or outbuildings, have it fixed or sealed by a professional. However, you must first ensure that there aren’t any raccoons already living in the space. If you seal them in, they will either go further into the house or die and decompose in your home. Evict these furry intruders first, then seal their entry points. When humans shop for a house, we often prefer the same elements: quiet, safety, and shelter from the elements. Raccoons like these things too — although curb appeal is less important to them. To dissuade raccoons from considering your house, make it unappealing by making their prime spaces look occupied by humans. Raccoons are scared of people; they only attack if cornered or if they’re protecting their babies. Their ideal home has little human interaction. Have a motion sensor in your garage that turns on any time the door opens, or a person enters. Use your attic for storage, and clean it regularly. When you use the spaces they prefer living in, they will avoid them. Another trick to prevent them is to leave talk-radio on while you’re out of the house. This creates the illusion that humans are in the home and the space isn’t safe for them. Even if raccoons have already moved in, it’s not too late for prevention and safe eviction methods. Make them uncomfortable by using the tips above to make your home unappealing. Remove food sources. 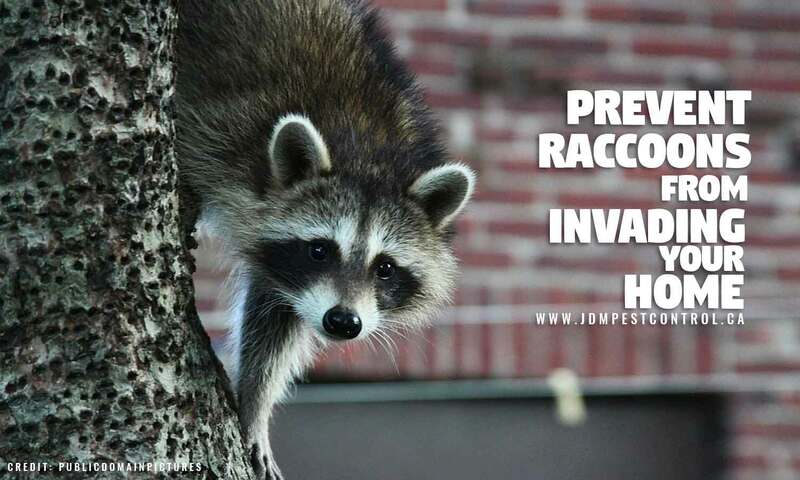 Call a professional pest control service to remove the raccoons for you humanely. In Ontario, killing or harming raccoons could result in criminal charges. Always call a professional pest and wildlife removal service to do this for you. Be wary of raccoons that have offspring. 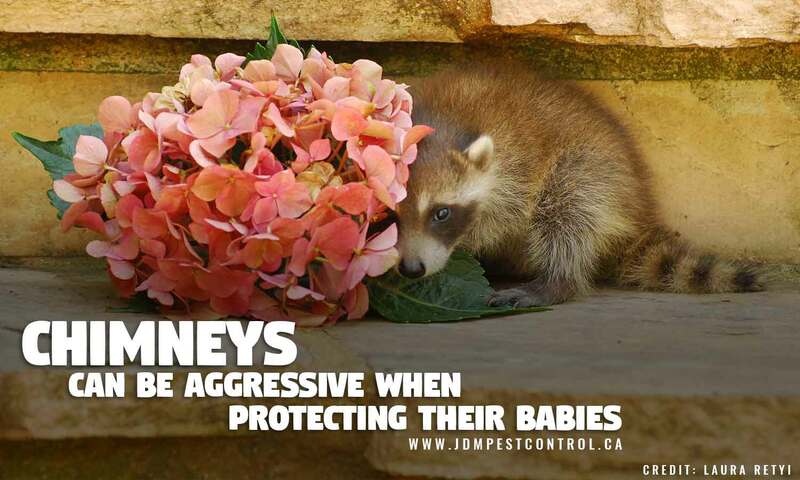 Raccoons can become aggressive when protecting their young. If the raccoons living in your attic or garage have babies, you may need to wait a few weeks before evicting them. Baby raccoons need to stay with their mother and in a shelter for 3-4 weeks after birth. This gives them time to get stronger, improve their eyesight, and learn some fundamental raccoon abilities. Until that time’s up, they aren’t able to leave the shelter and survive. Despite their cuteness, raccoons aren’t domestic animals. This could be an excellent opportunity to teach young kids about the difference between wild and domestic animals. It’s a chance for children to learn about respecting nature and the animals that live alongside us. In many cities like Vaughan, Toronto, and New Market, it’s common for humans to live alongside wild animals and pests. We don’t need to be afraid of them as long as we respect their space and prevent them from entering ours. 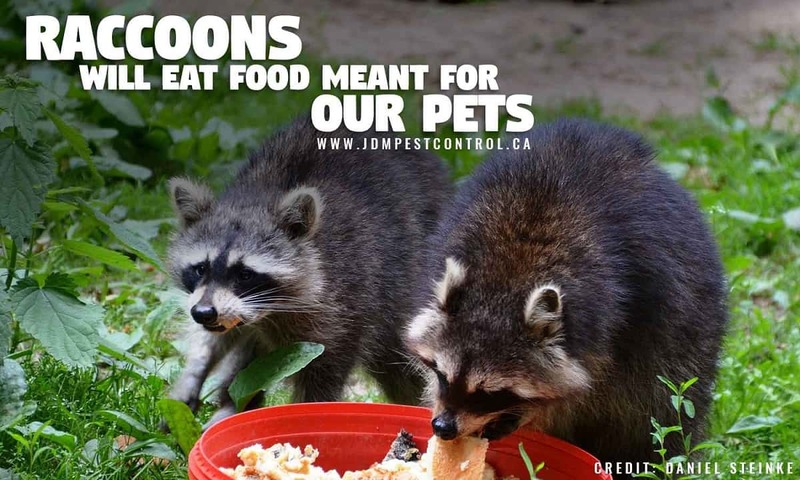 JDM Pest Control has been providing exceptional residential and commercial pest control in Toronto for over 20 years. We’re dedicated to using eco-friendly pest and rodent control methods that leave our customers satisfied. 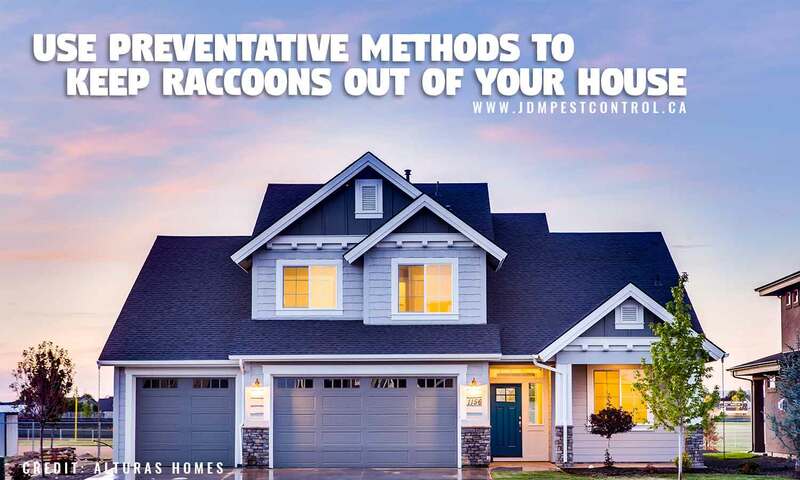 Whether you have ants, mice, flies, or raccoons, JDM Pest Control can remove the pests and ensure your home is protected. 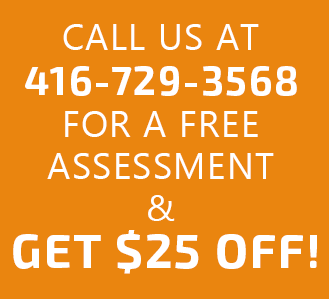 For a free assessment in Vaughan, Aurora, New Market, and the Greater Toronto Area call us today: (416) 729-3568.